Tuesday’s meeting saw over 400 people pack into the Oak Room in Tresidder. In a four-hour-long meeting on Tuesday night, the 16th Undergraduate Senate did not pass a resolution that called on the University to divest from corporations identified as complicit in human rights abuses in Israel and Palestine. Nine members of Senate voted in favor of the resolution; five members opposed and one abstained from voting. The resolution needed a two-thirds majority to pass. However, with the one abstention, the nine yes votes represented only 64 percent of the 14 votes cast. 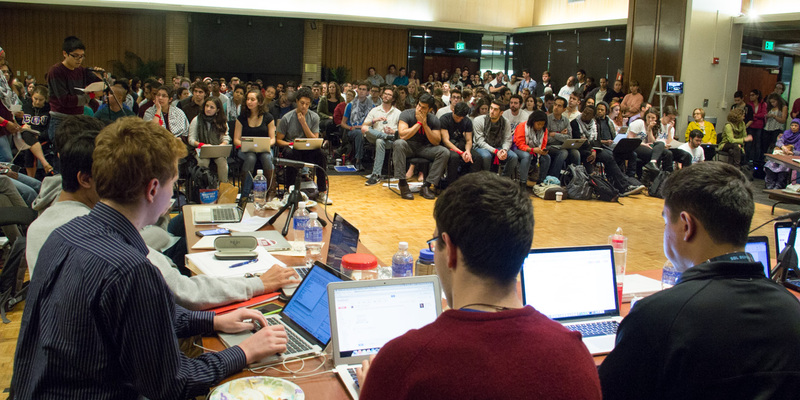 Approximately 400 students, professors and anyone with a Stanford ID crowded into the Oak Room in Tresidder to attend what one ASSU Senator called in passing “the most important ASSU meeting of the year.” Most in attendance found seats, while others chose to watch the live stream or follow the conversation on Twitter via #StanfordDivest. ASSU Senator John-Lancaster Finley ’16 voted yes after a meeting with Professor Clayborne Carson, the founding director of Stanford’s Martin Luther King, Jr. Research and Education Institute. “I asked myself that if I vote no, am I condoning the current course of action? Absolutely yes,” Finley said after the vote. Stanford Out of Occupied Palestine (SOOP), the group that brought the petition to the Senate, said in a press release that they are recognizing the vote as a victory due to the majority. Past votes on the issue of divestment did not receive such a majority. Discussion of the resolution opened with speeches from SOOP and then from Coalition for Peace, which opposed the resolution. Members of each group, in addition to unaffiliated Stanford students, were each given two minutes to comment on the language of the bill at hand. Some spoke more than once after senators surrendered their discussion time to these speakers. The Senate did not allow graduate students to speak at the meeting. Some students used their time to speak about the impact that divestment talks had on campus culture. Two RAs described how their residents felt uncomfortable with the campus culture surrounding the campaign: Specifically, one resident voiced fear that being seen opposing divestment would lead them to be seen as rejecting human rights. At the same time, SOOP claims that it has addressed these fears. SOOP recognizes itself as a coalition of 19 student groups without any formal leadership structure. The petition they circulated prior to the meeting garnered over 1,600 student signatures in support of divestment. Meanwhile, Coalition for Peace is a coalition of Stanford students who oppose this particular divestment campaign on the grounds that it contains inflammatory and inaccurate information, is harmful to future peace agreements and marginalizes and divides students. “As international students, we are really leaders of whatever country we come from, and so the Stanford community would be throwing [away] an opportunity to have an impact on this conflict in the Middle East by divesting and creating a situation that is contentious among community members, either marginalizing Jewish students or Palestinian students in either way,” said Margreth Mpossi ’15, a student from Tanzania and a member of the Coalition for Peace. One question that lacked a definitive answer was whether Stanford is in fact investing in many companies named in the bill. Stanford Review writer Elliot Kaufman ’18 told The Daily that he found no evidence that Stanford invested in any of the cited companies, except Eaton Corp and Raytheon, after his research into every SEC record filed by Stanford’s endowment going back to 2005. However, Stanford’s endowment also is invested in mutual funds, some of which may have investments in the companies in question. One motion, brought by Nick Ahamed ’15, a Daily staffer, called for tabling the resolution until the spring ballot for a student vote, which was met with groans from the audience. That motion was ultimately tabled. After the votes were tallied, finger-pointing and shouting erupted from a few individuals, but the majority of those in attendance remained silent. One individual was escorted from the room. Following the vote, the ASSU Senate offered CAPS services to students interested. “This has been hard for everyone. The question now is how we maintain our community,” said Sally Dickson, Associate Vice Provost for Student Affairs, who moderated the discussion. Contact Alexis Garduno at agarduno ‘at’ stanford.edu.